While foreclosure activity for the U.S. in May decreased by 3 percent according to a report released by RealtyTrac, the news was much worse for the St. Louis metro area, and Missouri as a whole. Every County in the St. Louis metro area, on the Missouri side of the river, experienced an increase in foreclosures in May from a year ago, and six of the nine counties contained in the report had an increase in May 2010 from the prior month. On the Illinois side of the river things looked slightly better with 3 of 7 counties seeing an increase in foreclosures from the year before and also 3 of 7 counties having an increase in foreclosures in May 2010 from the month before. The state of Missouri had a total of 3,841 foreclosure actions for the month; an increase of 5.67 percent from the month before and a 37.37 percent increase from a year ago. One in every 694 households in the state had a foreclosure action in May. The entire St. Louis metro area (9 counties on the Missouri side and 7 on the Illinois side) had a total of 2,558 foreclosure actions for the month; an increase of 12.29 percent from the month before and a 41.95 percent increase from a year ago. 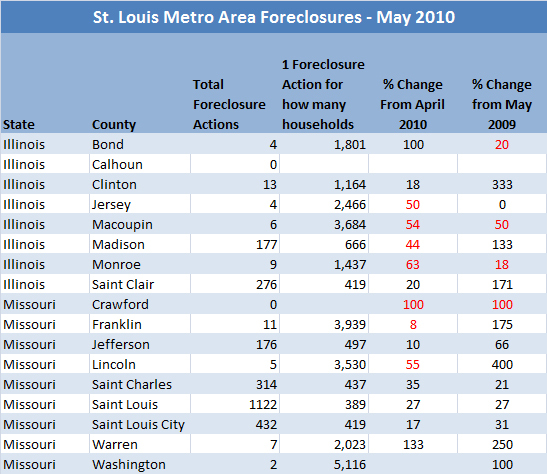 One in every 485 households in the St. Louis Metro area had a foreclosure action in May.